The only thing small about Tytus Howard is his school. This NFL Draft prospect from Alabama State is turning heads all over. To say that it’s a resurgence of NFL-Caliber talent at black colleges would be a slap in the face to the players who annually don’t get a shot to show their skills. But with the success of NFL All-Pro’s like Chicago Bears running back Tarik Cohen and Colts linebacker Darius Leonard scouts and teams are giving more top-tier black college talent a look. 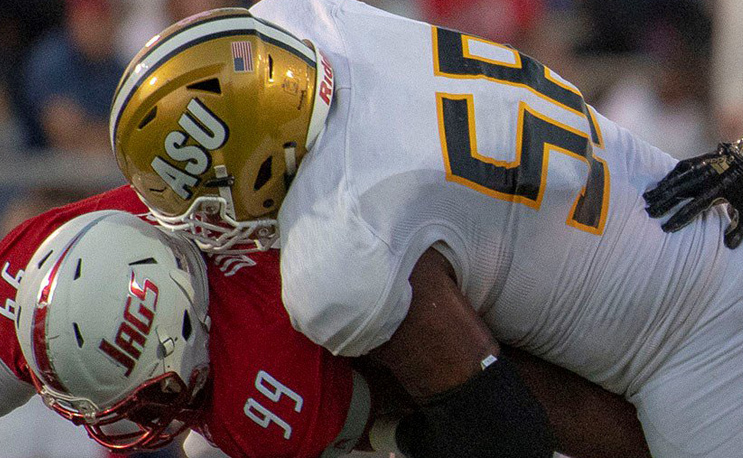 In the 2019 NFL Draft, the premiere name representing Historically Black College and University football is Alabama State tackle Tytus Howard. Despite being pegged as another “small school” gem, Howard has impressed enough people to receive an invite to the coveted Senior Bowl. Here is a full report on Howard, who looks to be the second Hornet drafted since 2007. In order to really appreciate Howard’s growth as a top tackle in this draft, you have to look at how far he came. An in-state prospect, Howard played quarterback at Monroe County High in Monroeville. Upon graduation, Howard entered Alabama State at 6’5 230 pounds prepared to play tight end for the Hornets. Over the course of his time as a Hornet, Howard grew an inch and gained over 70 pounds as he became arguably the most sought-after non-FBS tackle in the country. Howard dominated the competition in the Southwestern Athletic Conference and caught the attention of national media with a solid performance against SEC powerhouse Auburn University. As Howard prepares to display his talents at the Senior Bowl, it’s worth noting that the hype is warranted. Using the measurements from the Senior Bowl weigh-in only confirms Howard is a physical specimen. At 6’5 322 pounds, Howard has ideal NFL size for the tackle position. With 34 ¾’ arms, Howard has one of the longest reaches at the Senior Bowl. With 10 5/8” hands, Howard is a freak of nature. Howard’s past as a quarterback and tight end have helped him smoothly transition to the tackle position. Despite gaining nearly 100 pounds since high school, he has great speed as a pass blocker cutting off and keeping up with edge rushers. He has a solid foundation and gets out of his stance quickly. The only flaw, a major one, is Howard’s hand usage. For all of the length he has, Howard doesn’t consistently use his hands well enough to keep defenders at a distance. He doesn’t consistently fire off into the defender’s chest, which will be a problem at the next level. Howard tends to keep his hands low, but this is something that can be improved with coaching. As aforementioned, Howard went from throwing touchdowns, to catching them, to blocking for the quarterback. He’s exhibited the ability to play nearly anything on offense if need be, and has the size and strength to bump down to guard. Getting his hands on the defender first in pass downs is still a task, but in the run game Howard has the advantage. Because of his quick feet, Howard fires out his stance and can clear the way for an off-tackle run in a flash. If you ask Howard to lead block, he can do so with a mean streak. Tytus Howard is a physical specimen that has the tools to be a starter from day one in the NFL. Teams with creative offensive coordinators will salivate at the possibility of having a tackle who can score touchdowns (Think Donald Penn). Hands are a key factor in offensive line play, and Howard has some of the worst in this draft. But as with his evolution from a quarterback to tight end to tackle, Howard has exhibited that he has no problem being a student of the game. And he’s a damn good student. With the right coaching, Howard can be a Pro Bowler in the near future. Maliik Obee is an NFL Draft scout based in Maryland. Follow him on Twitter.